I hurt my back on Monday. It was a pretty serious ouch, so I have been home-bound and on Percocet for the last few days. Since the warning label on the meds says not to operate heavy machinery, sewing on the machine was out. I can’t just sit still, I needed something to work on. Luckily I had cleaned out a drawer a few weeks ago, and unearthed an in-progress, counted cross-stitch project. A little history on my fascination with cross-stitch, and this project:I first discovered counted cross-stitch when I was about 10 years old. There was this great needlework store in Sausalito, and I used to save up my allowance for weeks buy needlepoint and cross-stitch kits. 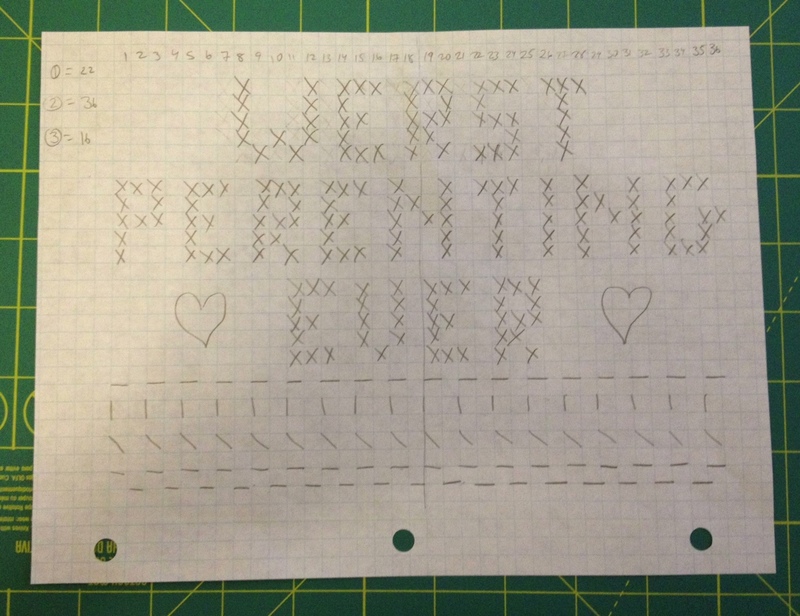 I didn’t have anyone to teach or coach me through these projects, and frequently found myself frustrated by the counting aspect of cross-stitch. As a result, I stuck to needlepoint. Flash forward a dozen or so years and I decided to give it another shot. I stuck mostly to very small, ornament sized kits. They were nice, but not very challenging. 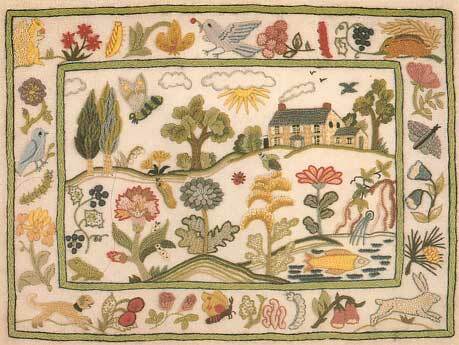 And while I enjoyed needlepoint, I preferred the look of cross-stitch. 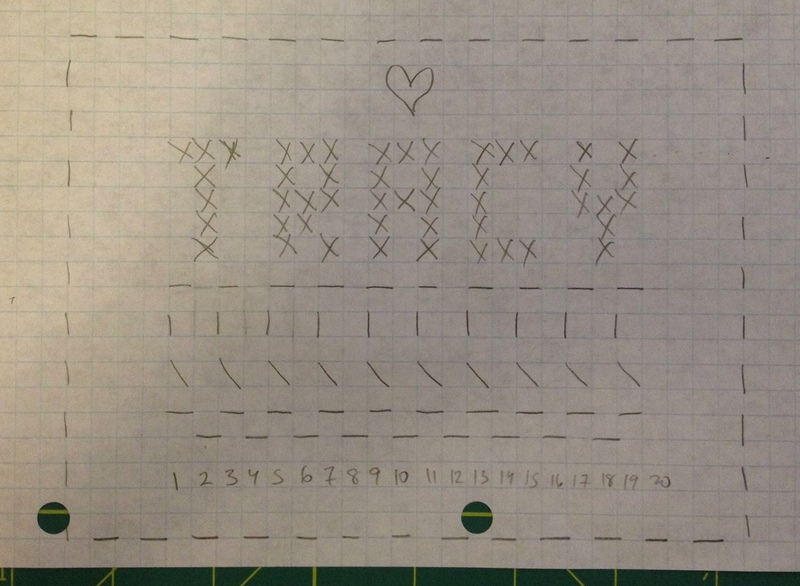 Someone suggested that I try Stamped cross-stitch, but I didn’t like the fact that the lines can peek through. 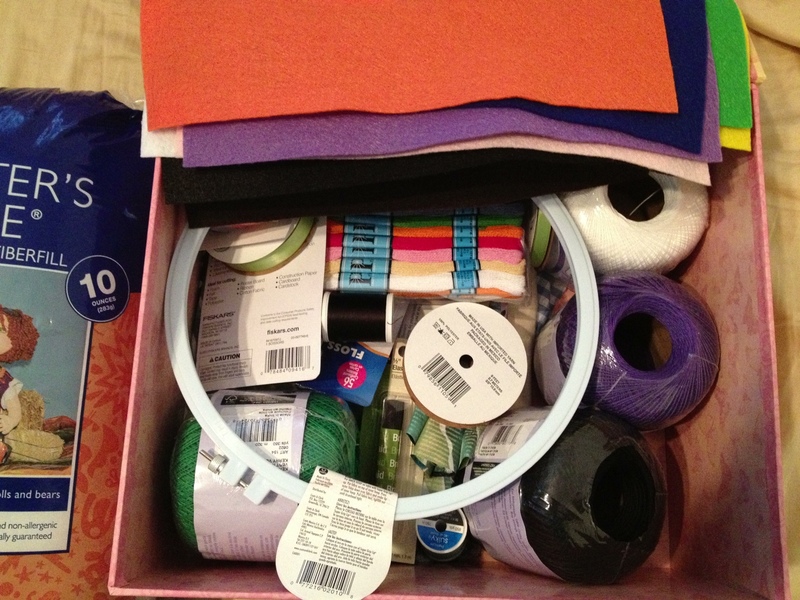 A few years ago, I discovered the plethora of crafting supplies on ebay, and began buying up a storm. I bought quilt kits, needlepoint kits, and cross-stitch kits. 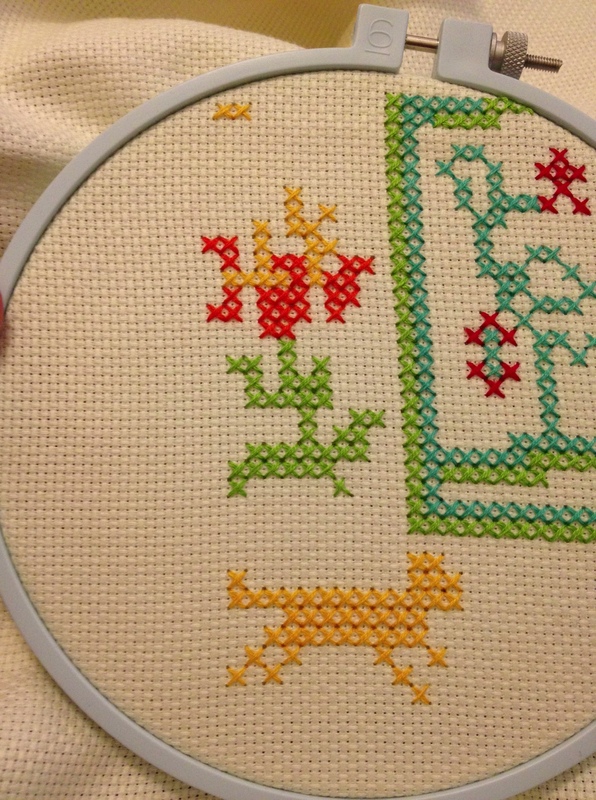 I was drawn to this fun sampler that used very 1970’s colors, and started on it. 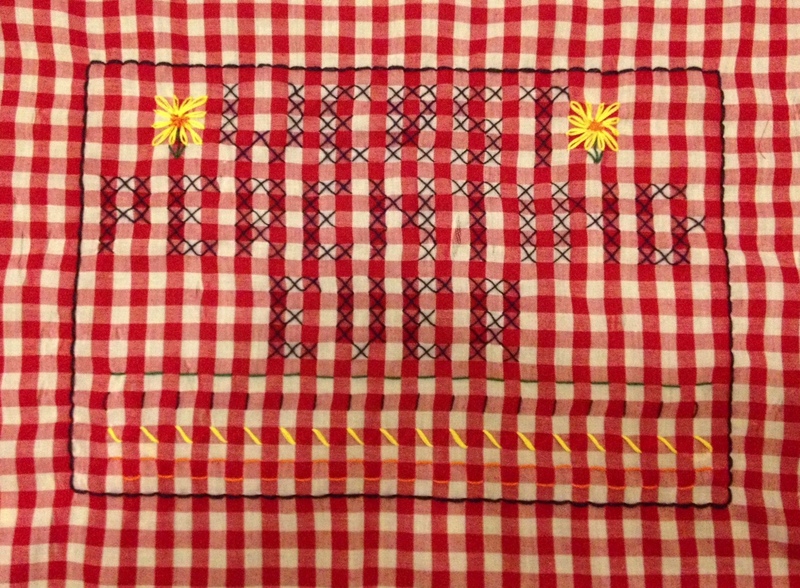 Soon quilting projects took over, and the sampler went back into the drawer, forgotten until last week. Since rediscovering this project, I have been on a cross-stitch bender! I bought some new books, a bunch of floss, and subscribed to a great magazine from England devoted to cross-stitch! Looking at it, I can see how the design was translated. I don’t do crewel embroidery, but there is a cross-stitch available for this pattern, and I’d LOVE to get that to really challenge myself. I have been working like a fiend on this project and have made significant progress. I have had to pick out a few of the stitches due to some miscounts, but all in all, this has been a great project to work on while recovering. This little “over the arm” organizer by DMC is fantastic! I use the pockets to store the thread snips and the pieces I am currently using. 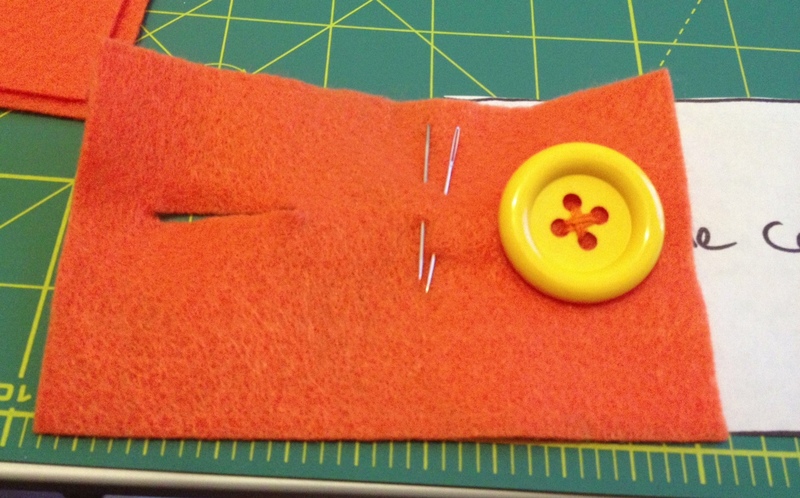 The larger pocket holds my thread card, and the little button holds the scissors while I am working. 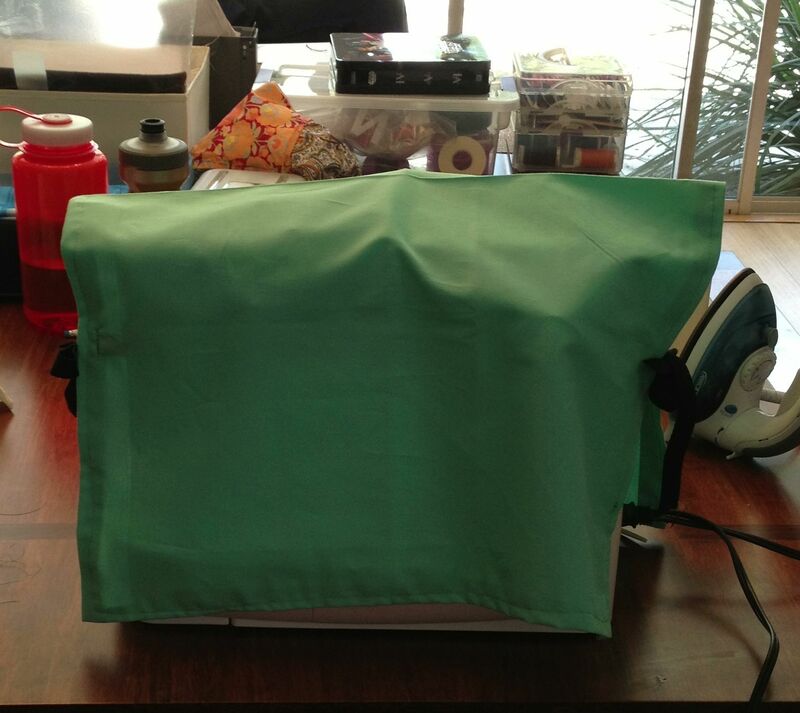 Even better, it folds up into a small-ish square and fits into the project bag. I love the bright colors and the kitschy feel to it. I’m not sure what I am going to do with it when I am done, but luckily, there is a needlework store near me that can help me decide! With my renewed interest in embroidery and cross-stitch, I have added many new books to my collection. I promise to update my bookshelf page soon! 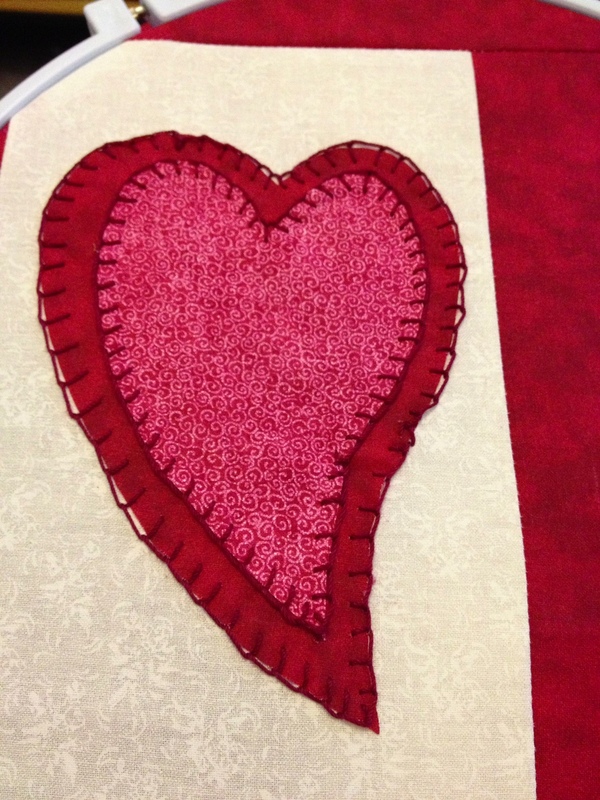 I had a lovely day sewing with my students today. 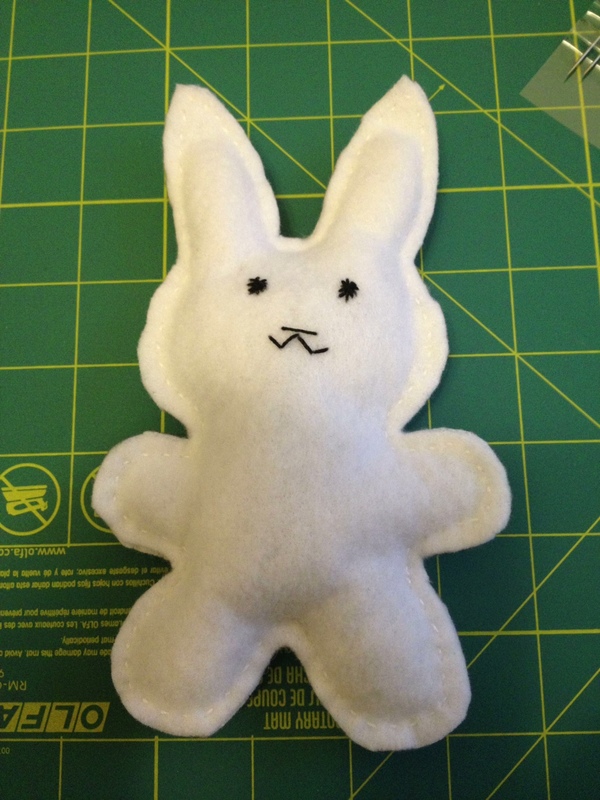 My first student made his own stuffy by drawing out a picture then tracing it onto the muslin (a project from Sewing School). 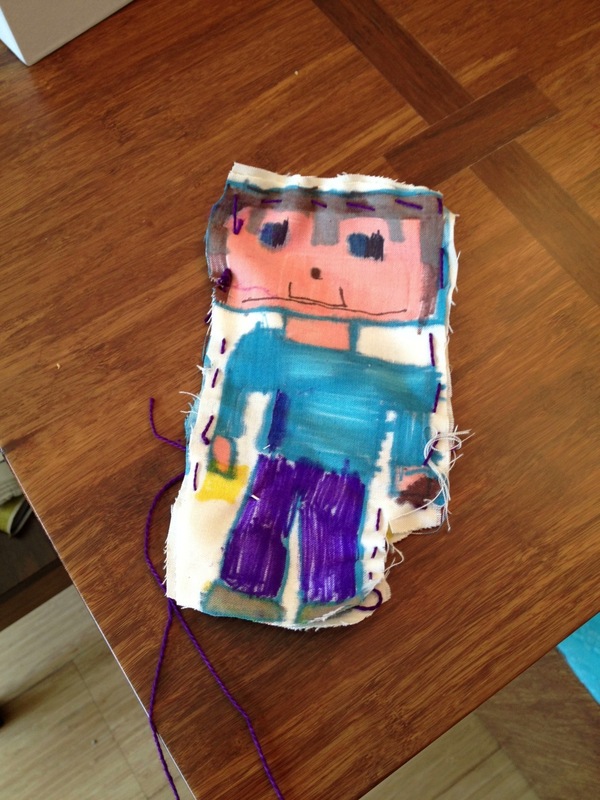 He decided to make a stuffy of a Minecraft character named Steve. 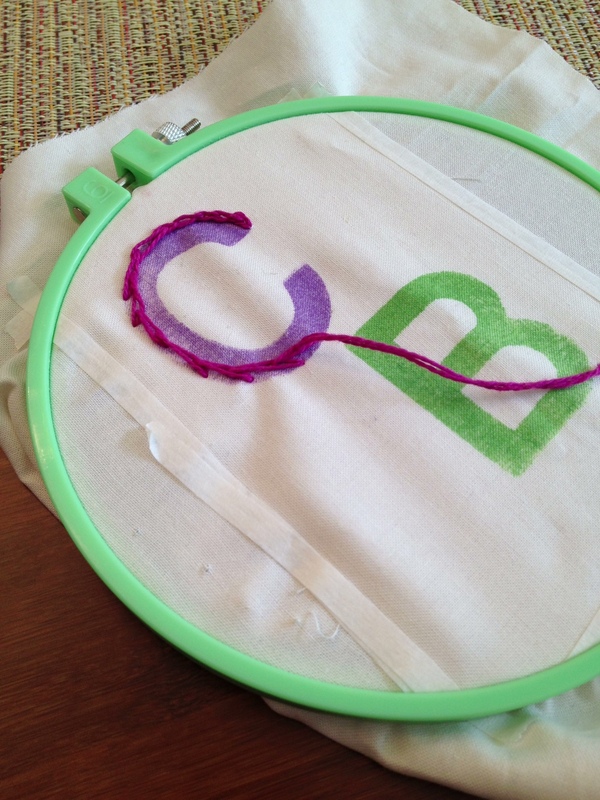 My second student is focusing on decorative stitching, so she is creating a letter sampler. This is not a traditional sampler. She is just learning how to sew, so we started with lacing cards, then moved onto posterboard lacing cards with holes punched in them. I taught her the Straight, Chain and Split Stitches. We decided that the Chain Stitch was a little too hard, so we settled on the Straight and Split Stitches for her project. The next step was to use 1 inch alphabet stamps to stamp the letters onto posterboard and muslin. I punched holes around the stamped letters using a tiny, confetti hole punch so that she could practice her stitches on a smaller scale. Once she had mastered the stitches on the posterboard, it was time to work with the fabric. She did a great job! I am looking forward to next week to see where we go next!!! At class yesterday, one of my students proudly displayed the thread pouch he made. I looked at it, and could see that he had taken all of the skills that he had been taught- making knots, whip-stitch, and finishing knots- and even added a new one- adapting a pattern- to make it. As a teacher, this is what I live for! I love it when a student takes what you teach them and does their own thing. This little boy has been making things each week (outside of class) and is continually refining what he makes. He tries things and figures out what doesn’t work before he makes the next thing. I look forward to seeing what he has created each week! The whole family is fantastic, and I love teaching all of the kids! I started teaching the youngest this last week, and she is a quick learner! We made lacing cards out of posterboard for her to practice a straight stitch, chain stitch and split stitch. Chain stitch is tricky, but she is getting it! The oldest daughter is almost finished with her sewing machine cover, and has already scoured the book for patterns that she wants. She wants to make a lunch bag for school, and is planning on making the eHold bag. I can’t wait to get started on that with her! As a teacher, I think it is vital that you continue to learn. Not only is learning new things fun, but it shows your students that education is a lifelong adventure, not just something you do to get a job. As a sewing instructor, I am by no means an expert seamstress, and I certainly have new things to learn! That was my goal over the weekend. It started as an organizing project. My sewing table was out of control! There were magazines and books stashed in every shelf and UFPs (Unfinished Projects) lurked everywhere! I finally decided that something needed to be done! I started by doing a serious triage on my books. I pulled all of my craft books off the shelf and got rid of all the books that are no longer needed (about half of them!) and went through the remaining books to find relevant projects or tips. 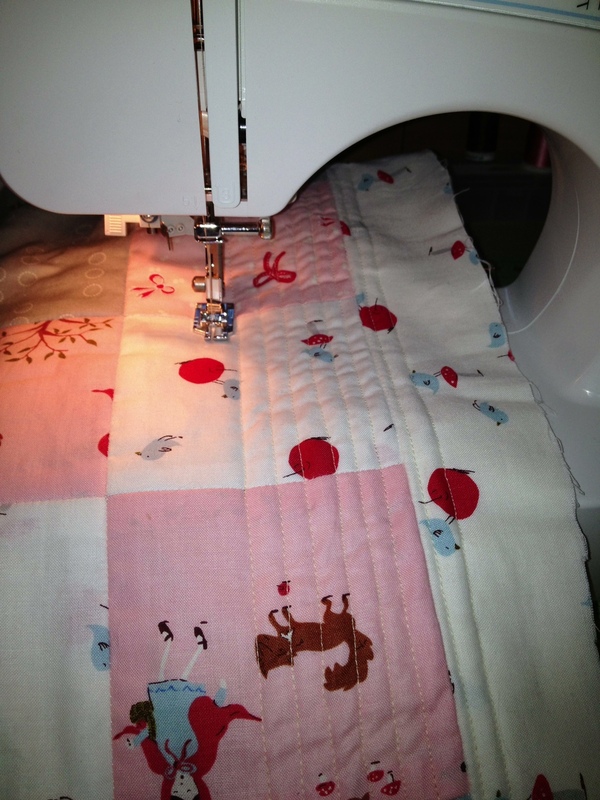 Next I found the Red Riding Hood Quilt that I had started tying off, but was nowhere near finishing. 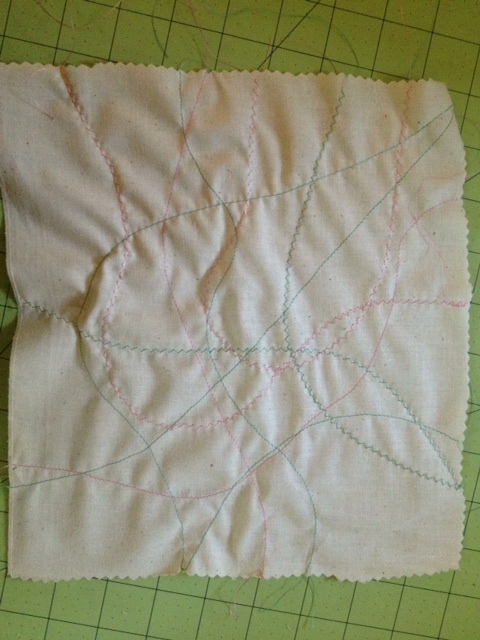 I have always wanted to try machine quilting (I have never finished a quilt with any method other than tying) and remembered a very simple method in one of my books. So, I went ahead and started. I now need to carefully cut out the ties and finish the quilt. It will happen! The lighting at my desk is terrible and lately the only work time I have is at night, so I decided on Sunday to finally tackle the hand applique work, since I can do that in another room. 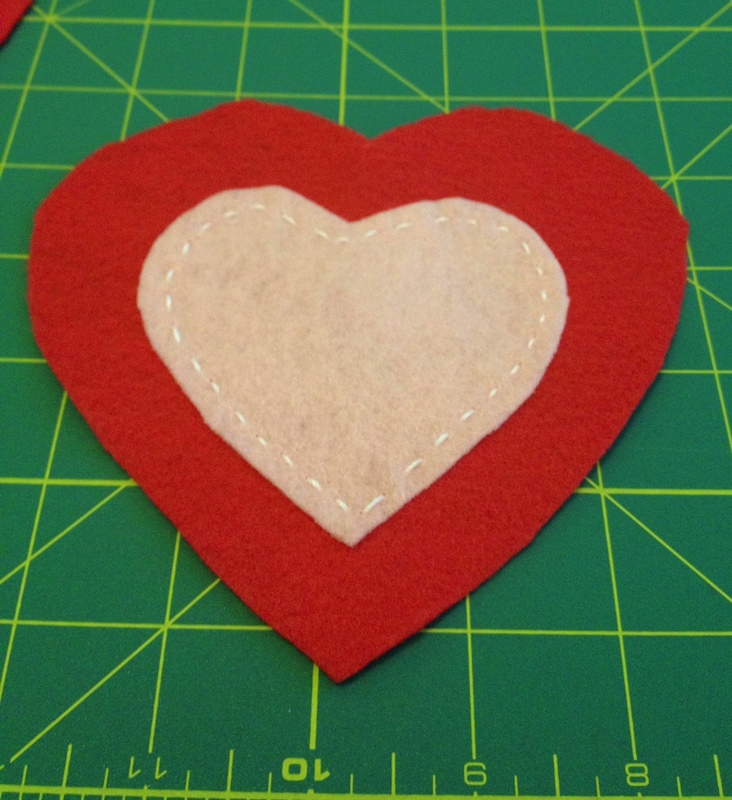 I decided to keep the edges raw and use a blanket stitch. I found a simple tutorial online, and got started. I’m starting to get the hang of it, but my fingers are not happy! It is certainly not perfect, but I like that I have finally tackled this skill! Last Friday I taught my first classes! A fabulous sister and brother duo had back-to-back classes! Thursday night I made all my copies, packed up my supplies and tried to get a good-night’s sleep! Friday morning I had the fun experience of schlepping all my supplies down our very narrow and very steep stairs. 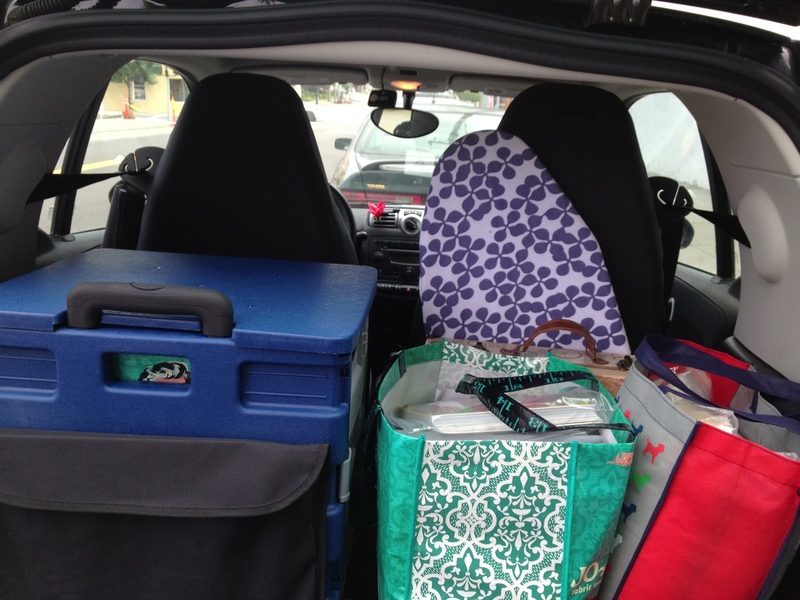 I then put all my years of Tetris to good use in loading up my SMART Car! My first student is taking the soon-to-be-added Simple Sewing Machine Basics class. She has had a sewing machine class before, but it was time for a brush up. We both had difficulty with the Singer bobbins (seriously Singer, you need to re-think the side load bobbins for machines marketed to kids!) but finally got the thing figured out! 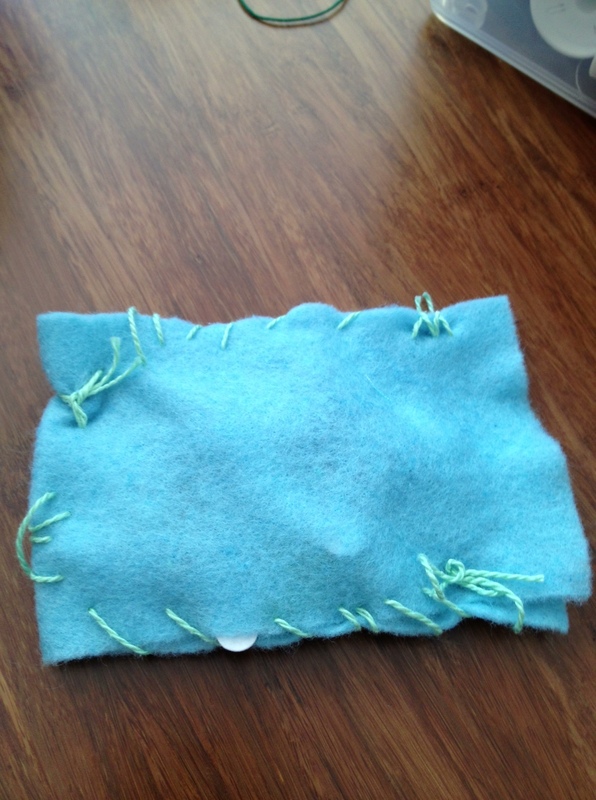 She learned some machine skills like a lock-stitch and turning corners. Her first project was a Stitch Sampler. She wasn’t quite finished with it when our class time was over, but I was proud to see her continue to work on it while I started her brother’s class! The brother is taking the Simple Sewing Basics, and he caught on right away! I start my class with the Discount School Supply Alphabet Lace-Up Cards. I like these cards, because they are two separate pieces. I teach the stitch with the letter, then they learn how to hold two pieces of material together by “stitching” the letter to the square card. 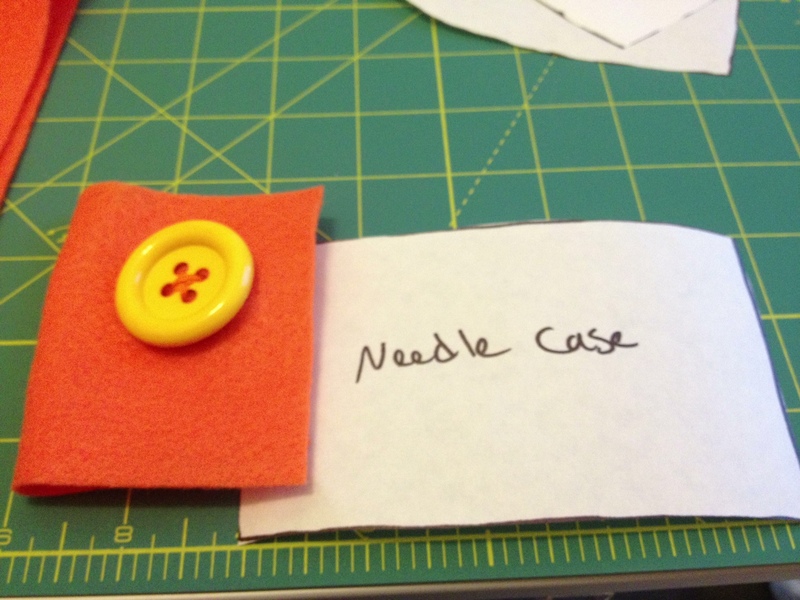 Once he grasped the basic concept, we moved on to his first project- the Needle Case. He was very excited to learn that he gets to keep all of his patterns. He wants to make projects for his sisters. Awww! Time went by very quickly, and soon it was time for car Tetris and good-byes! 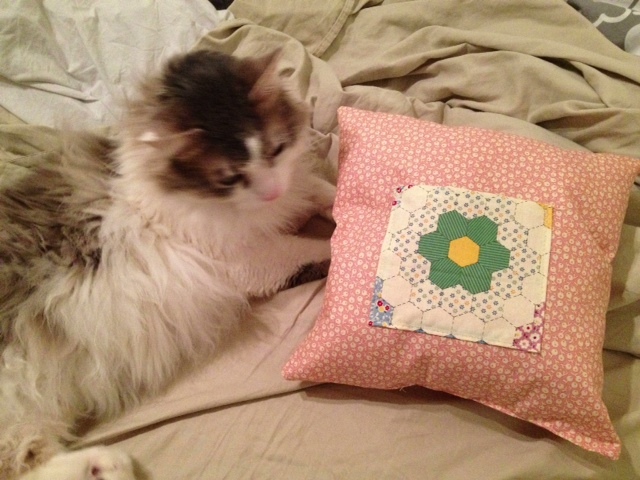 I have my second class session with them tomorrow where Pincushions will be made! I have my first student tomorrow- yay!! To ensure that I am ready for class tomorrow, I’ve spent the last week planning, buying supplies and making samples. This class is so new that it isn’t even up on my class list yet (coming soon, I promise!) and is a crash course in machine sewing skills. No one wants to get chalk dust all over their sewing kit, so here is a little pocket, closed with Velcro, for storing your chalk. I modified a pattern and project from Sewing School to make this by hand. I thought about adding a button, but decided against it. Next up is The Stitch Sampler. When you first learn to use a machine, there is nothing more exciting than just trying out stitches and going free form, so this project is just that! 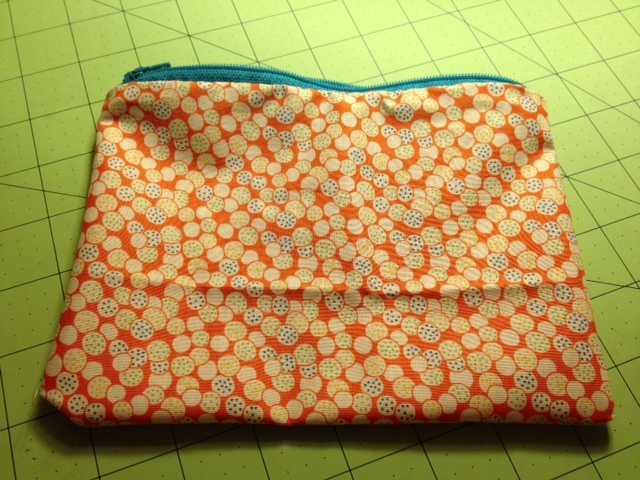 The final project I selected for this class is a Zippered Pouch (also from Sewing School 2). 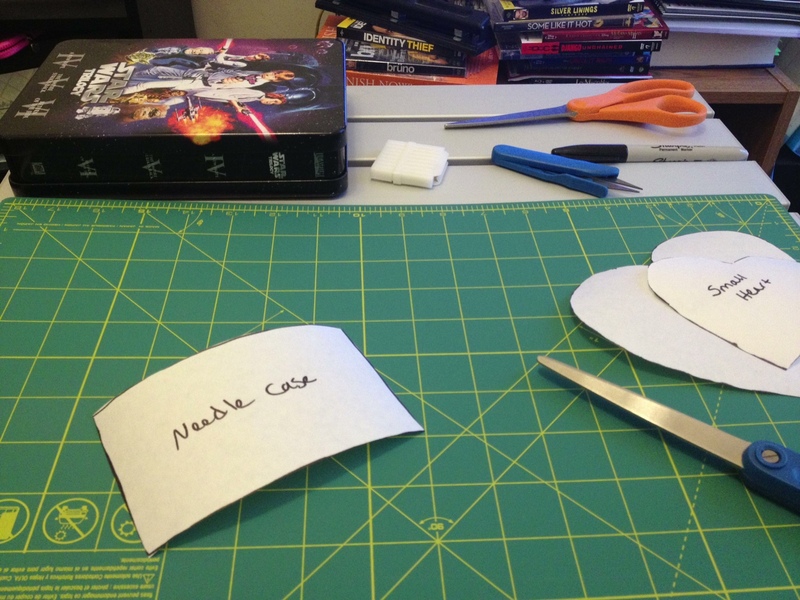 I have never sewn in a zipper, but the instructions were so clear, that it was a piece of cake! I’m glad that my student will get a chance to learn this at a younger age than 41! I had a lot of fun today making all of these projects, and I can’t wait to work with my student tomorrow! I spent my Independence Day happily working at my new little table while watching The Revolution on The History Channel. It was a good day! I am really thrilled with how well my adapted table is working out! The real test will come on Saturday when I attempt to use the sewing machine! 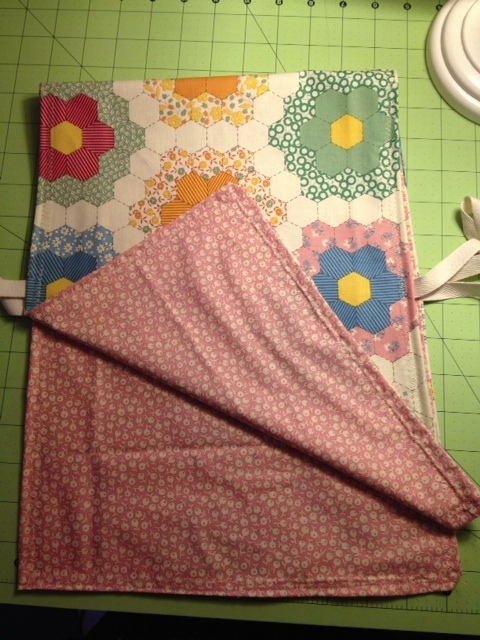 The first two projects I worked on are from the Sewing Basics class. 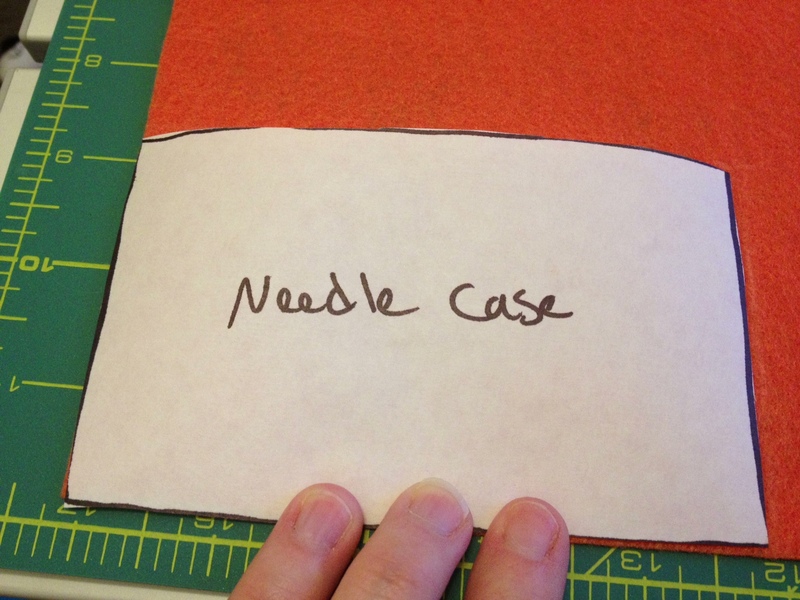 The Needle Case comes from the fantastic book- Sewing School. The Pincushion pattern is a Winky Cherry creation. 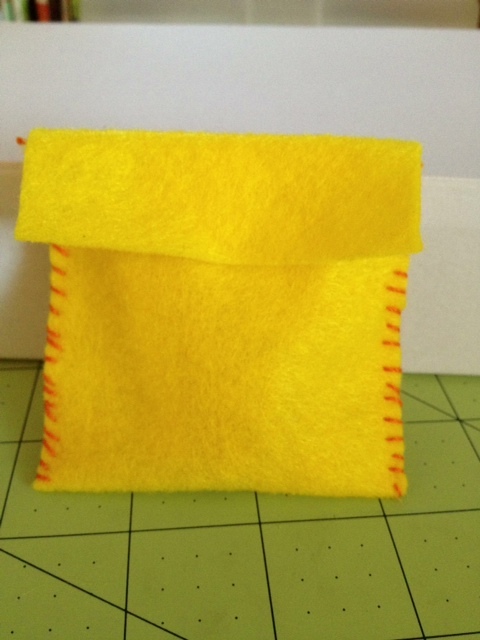 Using felt squares will make it easier for young children to trace and cut a pattern for the first time. 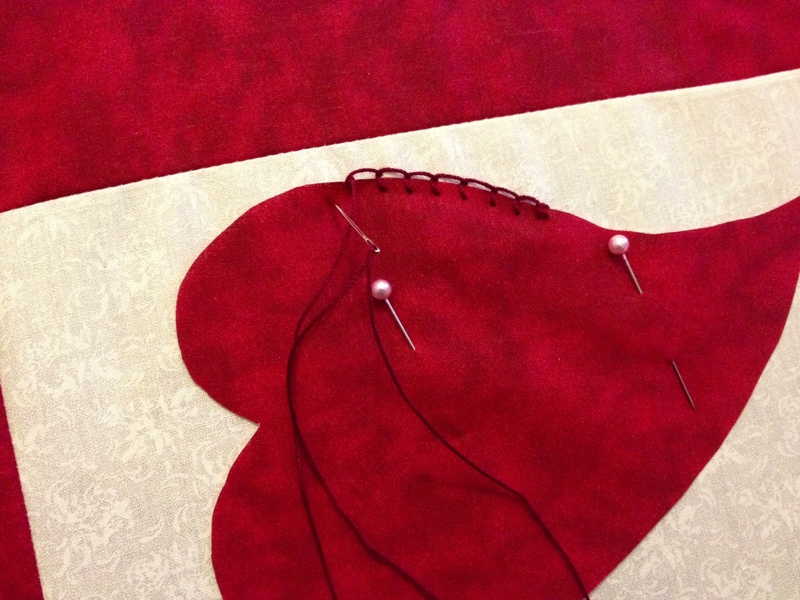 The Sewing School book has a great pattern for an apple pincushion, but I wanted to do something a little different. Since some of my students will be more advanced, I wanted to create a pincushion that was a little more challenging. 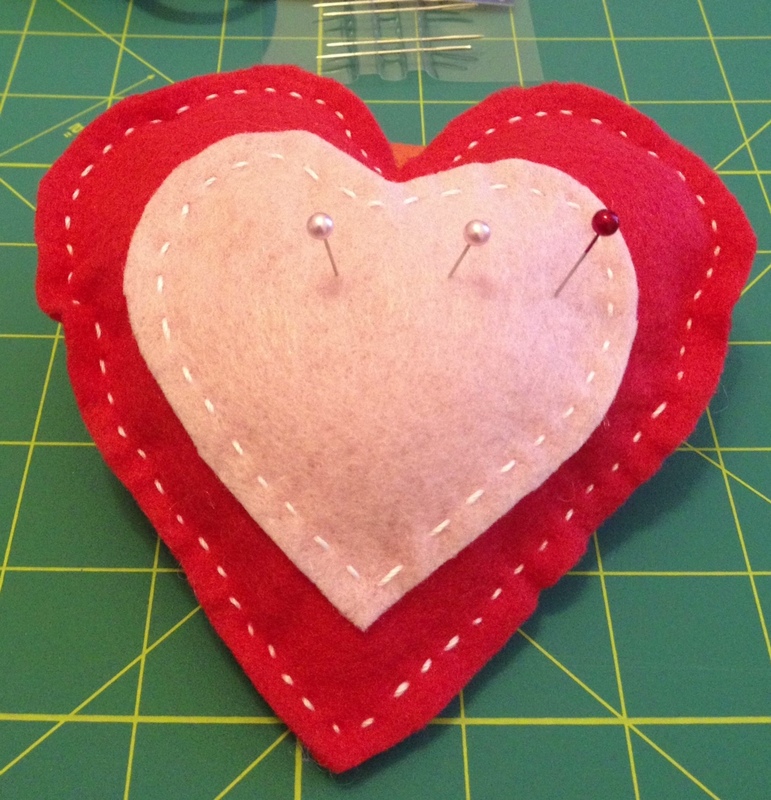 I took the small heart and large heart patterns from the My First Sewing Book pattern set, and decided to make a layered pincushion with decorative stitching. Next up was a simple Stuffy with another Winky Cherry pattern. I can’t tell you how many of these I made as a child in Winky’s classes. It was great fun getting to feel 8 years old again! For younger children, the pattern will be transferred in pencil to the gingham fabric. 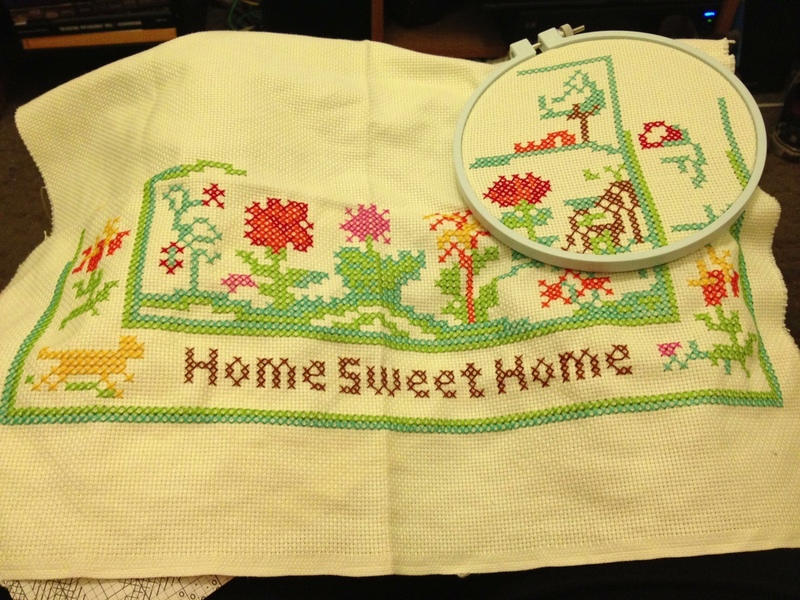 For more older students, it will be an introduction to counted cross-stitch. I went with my spelling- werst! It is hard to read in this picture, but here is my sampler! I have to work tomorrow, so I probably won’t be able to do anymore samples until the weekend. Until then- happy sewing! What do you do when your apartment has the world’s narrowest living room (seriously, the room is so narrow we were forced to get a flat screen TV) and so you can’t have coffee table? 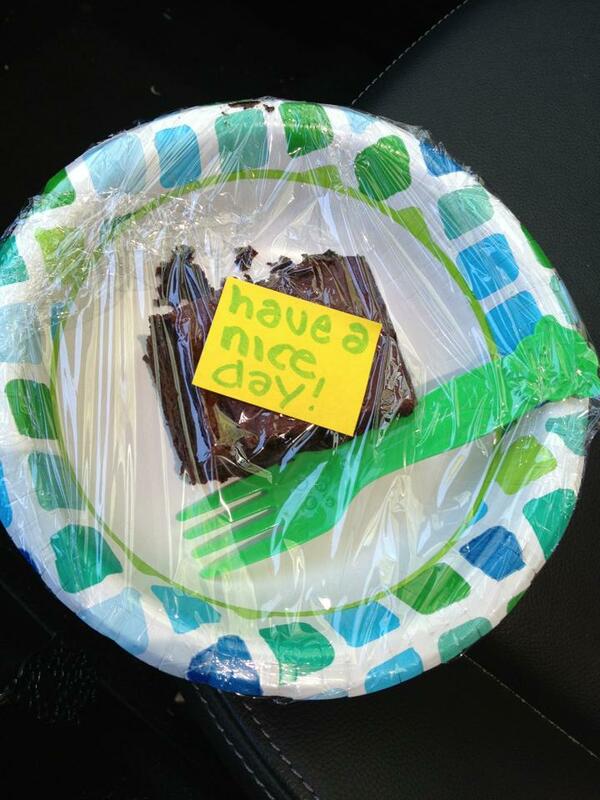 You get creative! I spent some time online looking for a low, folding table that could easily be stashed in a corner. No luck, until I found this. It’s a bit too rich for my blood, and the slats would make crafting difficult. The reviews also put me off a bit, but it gave me the idea to look at a sporting goods store for a camping table. I popped into Big 5 Sporting Goods and found this little table. It was the perfect height, and very lightweight, but there were those slats again. What’s a girl to do? 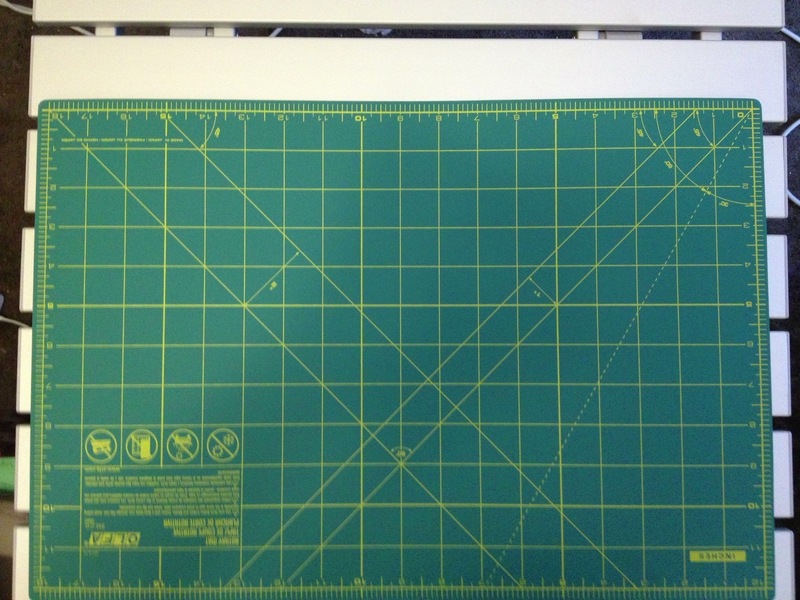 Suddenly it hit me- a cutting mat! 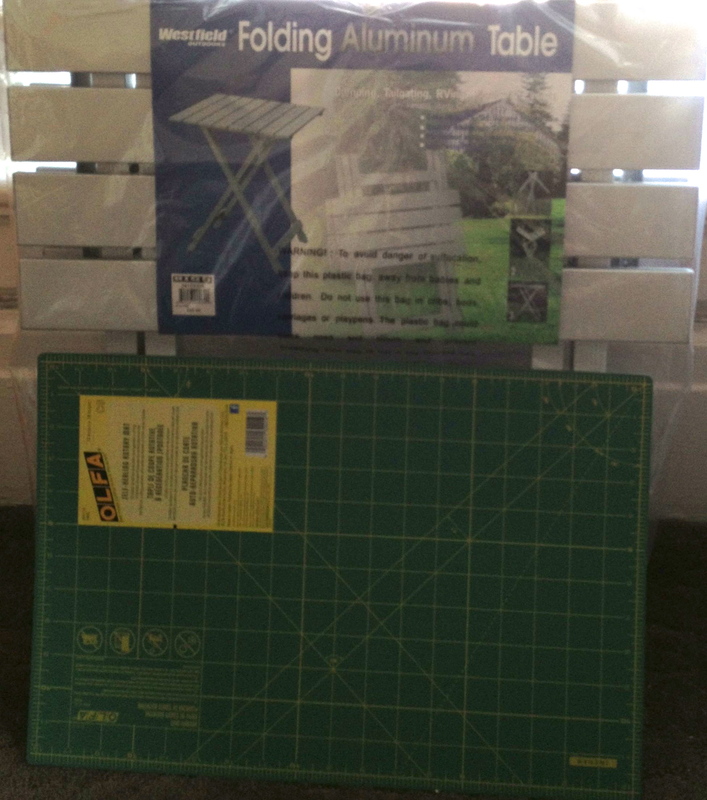 If I could find a cutting mat slightly smaller than the table, I could use Velcro to adhere the mat to the table (I want to make sure that the mat will stay still while working) and have a multipurpose surface to work off of. I found the perfect mat at Michael’s. 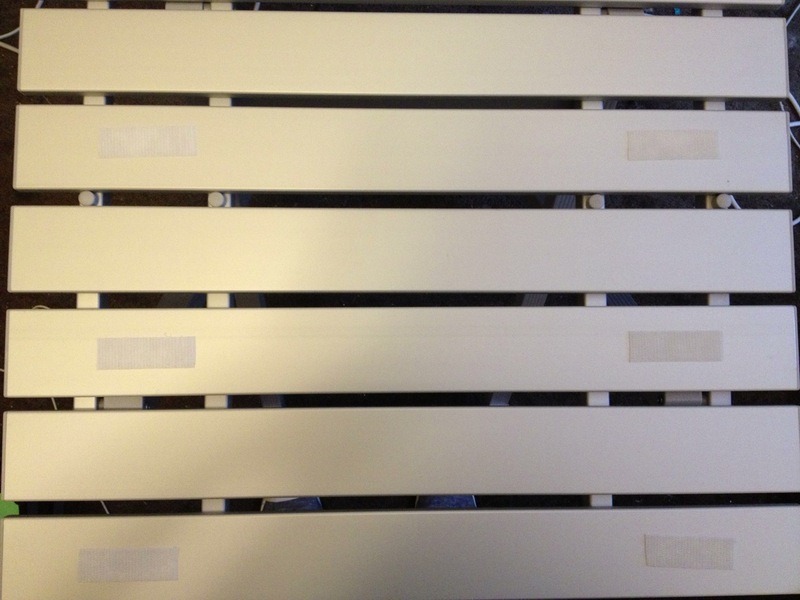 It is almost the exact width of the table, and two slats shorter. and voila! A small workspace that will fit neatly in the corner! In the end, I did spend more than I intended to, but I’m going to take the table with me on my next camping trip. That way I can justify this as dual purpose! 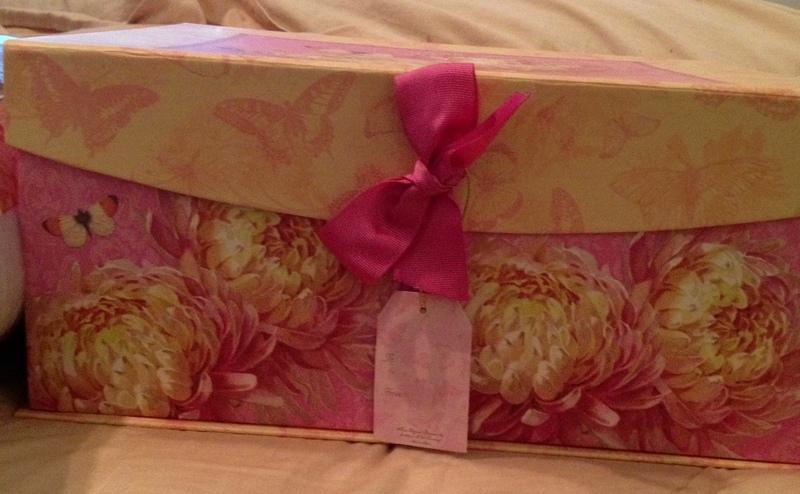 I spent an enjoyable afternoon at Jo-Ann Fabrics today buying materials for my sample projects. I came home with a big box of fun! Lots of felt, embroidery floss, crochet thread and COLOR! 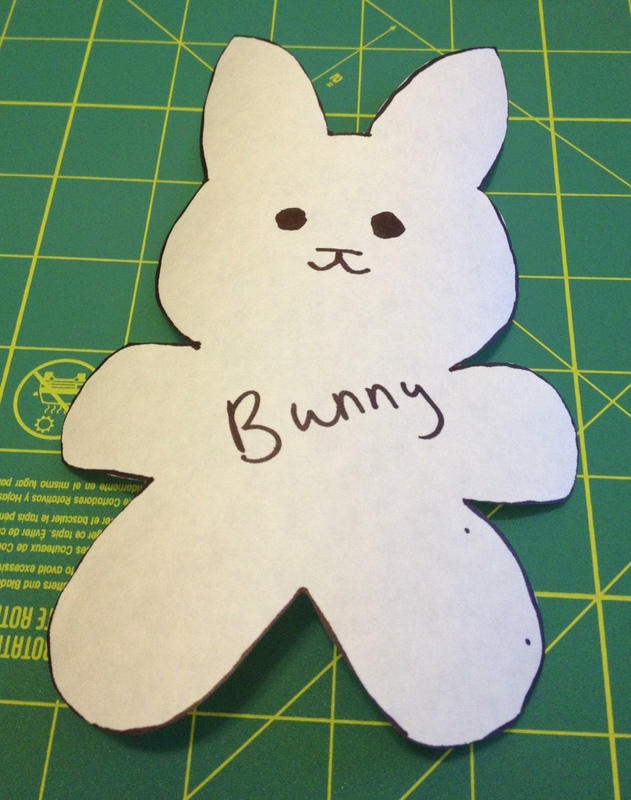 These materials will soon become stuffed animals, embroidered pillows, pin cushions, needle cases and much, much more! I also bought fabric to make the patternless dress, tank top and skirt. I should have bought fabric that was made for children, but I found some gorgeous fabrics and I just couldn’t resist making adult-sized samples that I can wear! 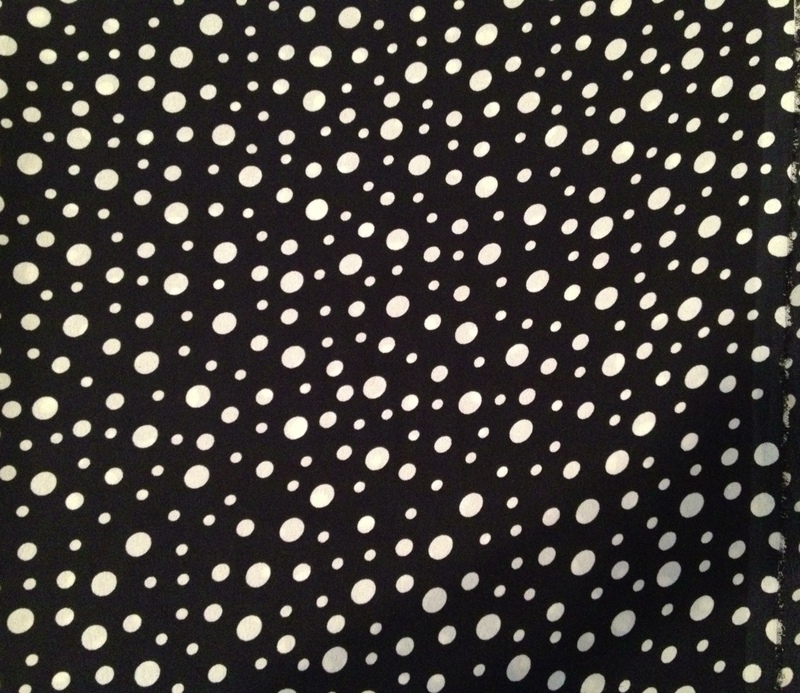 Fabric for the dressy tank top. This is the patternless dress, minus several inches. I am working on a way to add a decorative band to the bottom. 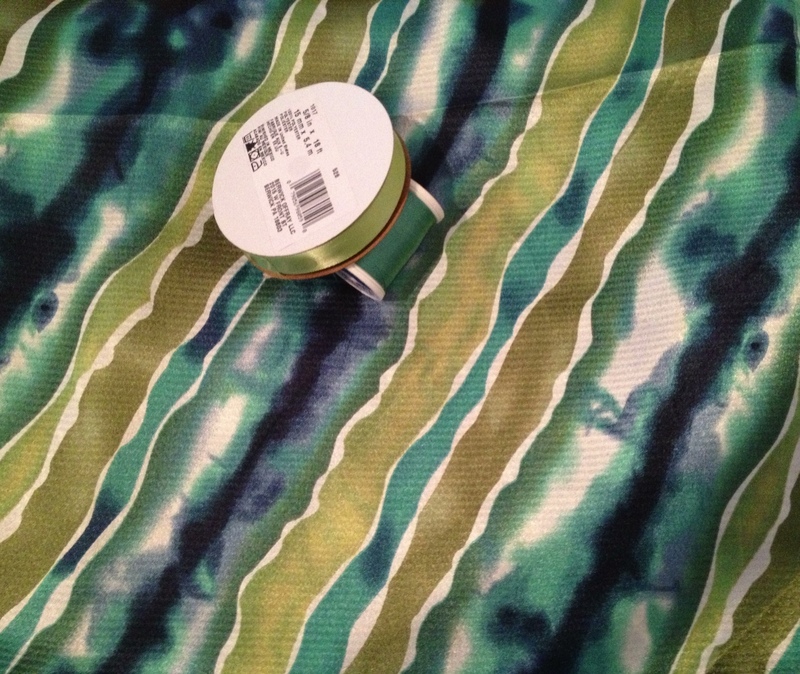 Fabric for the simple skirt. 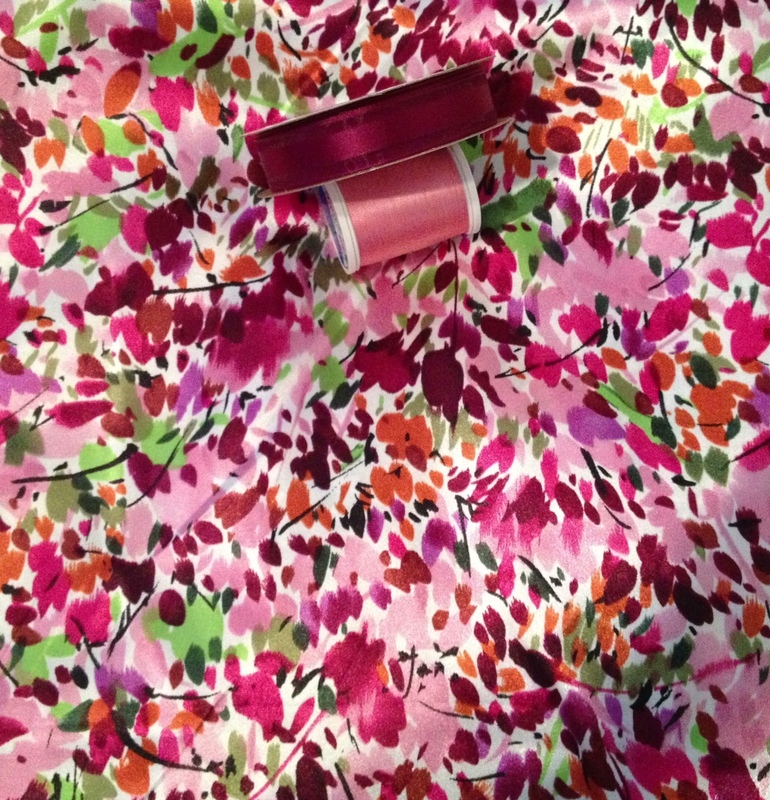 I am going to add a ribbon belt to hide the elastic waist band. Also, the fabric is somewhat sheer, so it will lined with the same fabric. I can’t wait to get started on these fun projects! It has been a long-held dream of mine to offer sewing classes for young children. Well, now that dream is a reality! I am now offering in-home classes for children ages 4-12. 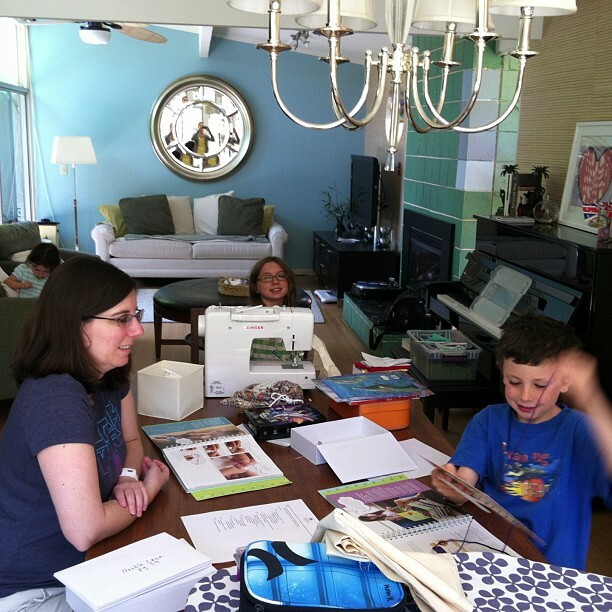 I offer both one-on-one classes and small group classes, with a discount for the host family. My classes are designed to be progressive, but more experienced sewers can jump levels to focus on what interests them. For a full list of classes, click here. In addition to my formal class offerings, I offer project coaching for students looking to expand their skills beyond the Simple Sewing track. 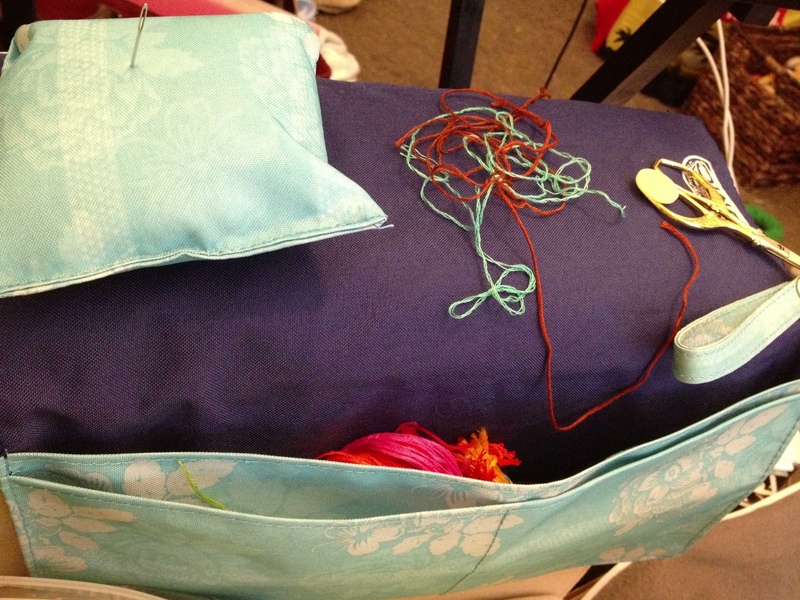 Coming soon: Simple Sewing classes for adults!